In 2017, Trump threatened North Korea with “fire and fury.” Kim Jong-un promised to “tame the mentally deranged U.S. dotard with fire.” By June 2018, they were holding hands. What happened? Events followed Trump’s default negotiating style set down long before he became president. He tells us that he likes to provoke an opponent. If the opponent is weak, Trumps forces him to submit; if the opponent is strong, he negotiates. “Fire and fury” provoked Kim and rattled everybody, but Kim didn’t give up its nukes to pacify Trump, and the U.S. didn’t attack. Given that the two leaders went on to meet in June 2017 in Singapore with surprising cordiality, we can infer that Trump concluded that North Korea was strong—more accurately, strong enough—a conclusion that fit the facts. For some time, U.S. intelligence had known that North Korea had about 60 nuclear warheads. By the end of 2017, the regime had mastered two key aspects of delivering a warhead: solid fueled missiles and mobile launchers. Solid fuel allows missiles to be fired rapidly, and mobile launchers decrease detection. To further aid concealment, North Korea has built some 10,000 underground military sites. These combined features have squashed the chances that the U.S. could pull off a preventive strike that could wipe out all of the regime’s weapons. If only a few nukes remained, North Korea could still destroy Seoul, Tokyo, and kill hundreds of thousands of U.S. troops on Okinawa. The bottom line is that Kim has fulfilled the intent of the nuclear program: a deterrent force capable of warding off a first-strike by the U.S. So, we see an odd history. U.S. hostility toward North Korea stemmed from its nuclear program, but the switch to friendly engagement resulted from the growing sophistication of the regime’s weapons! Yet, at least formally, the U.S. goal in negotiations remains the same as would have been obtained by war: the elimination of North Korea’s weapons, or “CVID,” complete, verifiable, irreversible, denuclearization. If the Trump administration holds to this literal interpretation of CVID, prospects for a deal are dim. Russian president, Vladimir Putin, put it starkly when he noted that North Korea would rather “eat grass” that abandon its nukes, given that the weapons are the surest way of making it too costly for the US to strike first. Weapons experts have also noted that while denuclearization of the Korean peninsula is physically possible, it does little for North Korea, because the U.S. holds an array of nuclear weapons nearby on surface ships, submarines, and aircraft—and these aren’t going anywhere. However, CVID might turn out to mean something more flexible—arms control rather than arms elimination. Trump alluded to this when he declared that North Korea’s nukes were “no longer a threat to the U.S.” Given that the weapons still exist, his words seem bonkers, yet from another perspective they’re coherent. What makes another country’s nukes a threat to the U.S.? Surely not mere possession. What is decisive is the political relationship. The U.S. not only condones Israel’s nukes, its close military and industrial ties foster their development. Despite tensions between Pakistan and India, their weapons elicit no bombastic threats from Trump. Privately, some U.S. diplomats talk about “flipping” North Korea, bringing it into the U.S. orbit, or at least diluting Chinese influence. This may seem farfetched, but who in 1989 foresaw that Poland, a solid member of the Soviet controlled Warsaw Pact would enter NATO only a few years later? Also, no one views North Korea as a strategic competitor to the U.S., a role reserved for China, which is flexing its muscles in the South China Sea and elsewhere. U.S./China competition is sure to rise, so some policy makers want to remove North Korea’s nukes from the chessboard, i.e., cancel them as a threat. Nonetheless, the path forward is a minefield, because the U.S. government doesn’t speak with a unified voice. While Trump still touts diplomacy, the post-Singapore period saw the appointment of John Bolton as national security adviser; he was previously a fierce hawk on North Korea. And elements of the U.S. military don’t look kindly at the rapidly evolving détente between the Koreas. 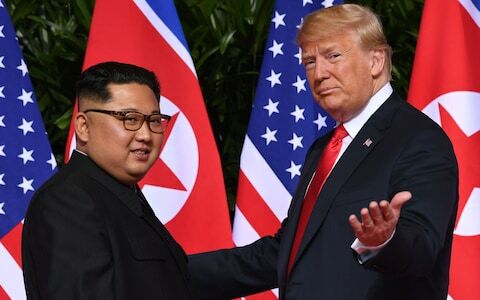 The June 2017 summit between Kim and Trump was brokered by South Korean president, Moon Jae-in, and the two Korean leaders have moved to ease tensions and tear down barriers, most visibly shown by the removal of guard posts and the rise of friendly exchanges between soldiers of the two countries. Beyond that, far more substantial plans are in the works that will integrate the two economies: industrial complexes that will hire hundreds of thousands of North Korea’s workers and vast infrastructure projects from rail lines to energy pipelines. However, more than 60 years since the armistice, the U.S. still wields power over the South Korean economy, and by blocking the passage of a train from South Korea to the Chinese border, the U.S. command in Seoul impeded the goal of harmonizing the rail lines. That may seem odd, but greater integration of the Koreas and growing amity between the leaders suggests eventual reunification—and that undermines the need for the 28,000 U.S. troops in South Korea. Not only has the enduring conflict eased Stavridis’s goal, the alleged North Korean threat has fostered the remilitarization of Japan, and that’s a boon to U.S. military contractors. In October, Trump, with his typical lack of discretion, declared that South Korea would not improve relations with Kim “without our approval.” But the evidence belies this, and as Moon Jae-in strives for greater independence, as Moon and Kim seek to tie their economies, and as they both work toward greater regional integration with Russia and China, a titanic struggle is shaping up in North East Asia, a struggle whose outcome remains most uncertain.